It’s no secret that salmon runs in the the Gulf of Alaska have been hitting new lows this year, with most salmon returns being down from last year, and there even being a request for a disaster declaration on the issue. With commercial fishing being such a huge way of life for many Alaskans, this raises the question of how this year affected commercial fishing in the Gulf Alaska. In Cook Inlet however, it was a different story, Tad Russell, a commercial fisherman of the area for 8 years says it was the worst season he has ever seen. 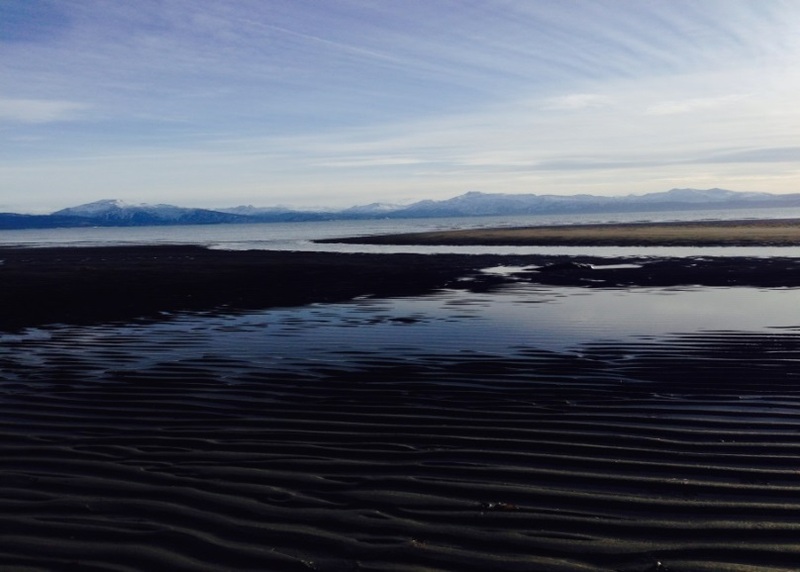 Earlier this year, Tad and a group of other commercial fishermen from cook inlet met with Alaska Governor Bill Walker and Commissioner of Fish and Game Ted Cotton, to see what could be done about their situation. 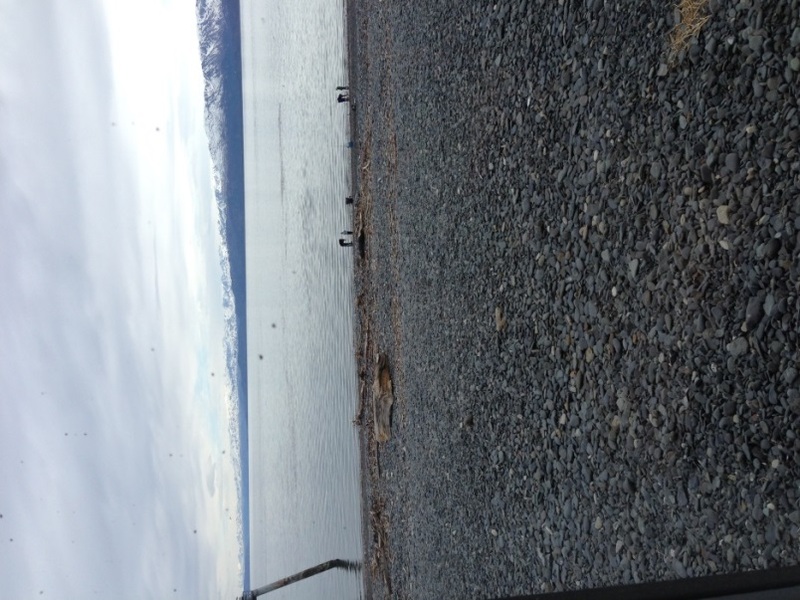 With the only help being a reprieve for their loans on their boats for the year, and there is a possibility of a disaster declaration going into effect for commercial fishing in cook inlet, similar to others in affect around the Gulf of Alaska, but nothing is for certain. As far as the fishing season goes, Tad thinks there needs to be many changes in policy regarding the fishing season, like lowering the escapement, by allowing fewer fish to spawn, or possibly extending the season. 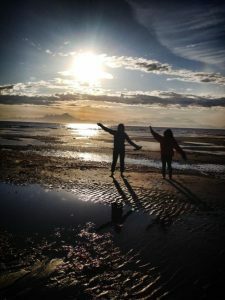 The future for commercial salmon fishing in South Central Alaska appears uncertain, but if this year anything, it’s that something needs to be done in regards to commercial fishing, according to those who out on the water. With the 2018 Homer Mariner Cross Country season ending at the state championship meet September 29 and 30, both the girls and the boys team returned with 3rd place overall team finishes. Luciano Fasulo lead the boys, placing 7th overall, and Autumn Daigle lead the girls team, placing 2nd overall out of 20 teams. For Autumn Daigle, the team’s positive attitude, desire to improve and great leadership have encourage the team success. Autumn described how the coaches have implemented “the science of running” into their practices to increase everyone’s ability to perform. Daigle also said, “my teammates all encouraged each other to be healthy, such as drinking lots of water.” The team uses a group chat to remind each other to drink water and to communicate about upcoming events. Daigle attributes past years success to former coach Bill Steyer. What lessons Daigle can take away from her time on the cross country team is learning how to work hard, show up and how to deal with adversity. Both teams are looking forward to continued success in the future. Given the teams expected low turnover rate, Daigle says that a goal for next year would be second at a state. School shootings have become one of the most important topics over the past few years. In response, schools have started to incorporate active shooter drills, dubbed ALICE drills, at Homer High, as a way to prepare the staff and students. On Thursday, October 5th, Homer High underwent such a drill. Throughout the school, teachers showed students a video titled “Lockdown,” by ALICE Training Institute. The seven minute video covered the basics of what to do during the situation: alert, lockdown, inform, counter and evacuate. The teachers then went over different scenarios and how their individual classroom would respond, taking suggestions or questions from students. Since the school has been using the same ways to address the issue for a few years, Homer High students shared their perspective on the effectiveness of the drill. The change comes after a bleak reveal of the new KPBSD budget, with several teachers being laid off to account for the deficit. The school lost 7 teachers last year, according to Doug Waclawski, the principal of Homer High School. Although the school library got new computers, it also lost the laptop cart that many students cherished for its accessibility and flexibility for use in free and online periods. As the school replaces older computers, the loss of the old ones has severely impacted many students. “To keep my grades up in online government, I need a laptop,” says HHS senior Nina Ellington. “I have no choice but to bring my own.” Homer High scholars struggle for easy access to computers for use in online classes, a quickly growing concern as online classes become more prevalent. As 63 students have at least one online class at the school, the need for consistent access to computers has expanded. In some instances, students have turned to each other to ask where they could find a laptop when the library is closed with a class inside and the computers in the lab are all occupied. One common “last resort” for students who need to work on their online periods has been to borrow Mr. Stineff’s laptops or those designated to other teacher’s rooms. The search for internet access in the school has taken away from time that students could be utilizing to get ahead in their classes- for the first week of the school year after the changes had been made, some students were even unable to find a place to work or computers since the library was then being occupied by classes and off limits at times. Although some grapple with the new situation, others claim that it hasn’t been an issue for them. Clayton Arndt, a senior and a journalist who needs computer access to write articles in time to publish them on the school blog, claimed that “I’ve still been able to get my work done.” Clayton, among others, says “It’s not so bad once you learn to track down the laptops or find one in a classroom to use.” Although new computers may not have fixed the problem of too few computers, Homer High School students are finding ways to get work done. How Free is Your Education? Many classes are free to students at Homer High School. “Electives have a ranging cost from $5-$100 but only cadcam is free in the electives,” says HHS bookkeeper Kristen Metz. Every student is required to take 7.5 electives in high school in order to graduate, so breaking that up into each semester being .5 of a credit, by the end of a student’s senior year, they must take fifteen electives of their choice. The HHS football program has transformed quite a lot in the past few years, and perhaps its most significant change is the team of 2017 versus the one of 2018. The 2017 team dropped a game to start the season, but then went on a tear for the rest of the year, utterly dominating their conference with a 4-0 record without allowing a single point scored against them in conference play. They developed an overall 8-2 record with several landslide victories, with their only other loss in the state championship game. Both games they lost were only one score games, showing how even in a loss they were competing in each game they played. This is a far cry from the 2018 Mariners, who currently hold a 1-6 record with their lone victory coming against the regular punching bag of the conference, the Seward Seahawks. The Mariners graduated nine seniors last year, with eight of those starting on almost all aspects of the field (offense, defense, and special teams). Three of those eight went on to play football at the collegiate level, but perhaps the thing that hurt the current team the most was graduating that much leadership and fraternity. The leadership of the team has fallen to the now diminished upperclassmen, with only five seniors and three juniors on the team with a surplus of sophomores and freshmen. However the future looks brighter for this team. “Obviously it didn’t go well for us this year. But honestly I could see this team being pretty good next year and even better the year after that if these same guys keep playing together and build that skill and chemistry we had last year,” Jadin said on the the future of the team. With limited senior starters leaving and more and more younger players showing up to play, learn and grow with each other, the Mariner’s fortune could be changing very soon. Recently the community voted to build a new police department in Homer. Its new home is on Smoky Bay Street, right in the center of town. The building at this new location costs approximately 7.5 million dollars and is causing a .35% sales tax increase for all of Homer, according to official city of Homer site. 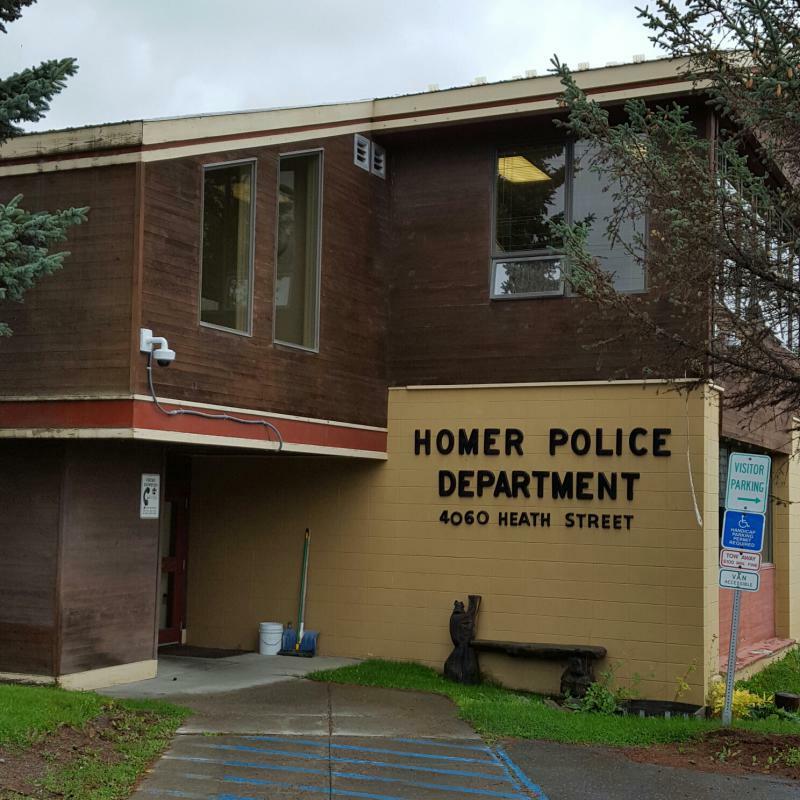 The present Homer police department was initially built in 1979, containing four jail cells, housing seven staff members, and spanning approximately 2,610 square feet according to the official city of Homer site. Being currently 2018, the police department is being relocated. Its new home will be on Grubstake Street. But this calls to question whether it will impact the feel of safety at the high school? Perhaps maybe even completely alter it? There are many benefits to having the police department be a two minute walk from the high school. As many of the students in Homer High know, there has been an influx of new arrivals at the school, teachers and students alike. One of the new teachers is Ms. Ciccarone, a language arts teacher. Students in her creative writing class are exploring literature through a different point of view than they have previously, the literal deconstruction of novels. They are cutting, burning, and ripping apart the books. Then they use the words and pages to create new art of their own. It is “Charter school mania” as she puts it. So, when she found Homer High School, she was very excited to apply. “I found Homer High School on Facebook, and I emailed the principal. He said there wasn’t any openings at the time.” A few months later, in May of last school year, Mr. Waclawski contacted her again, offering an interview for a new opening. 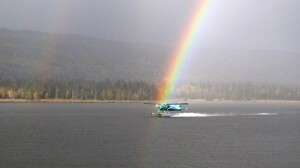 In my family, the day that the first float plane takes off from Beluga Lake is the first day of spring. And spring is here! 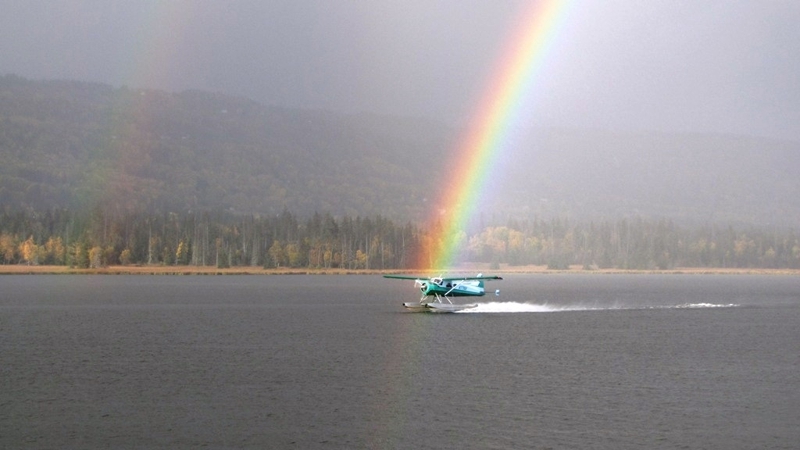 Pilots have cleaned up their float planes and inspected them for leaks, and off they go! 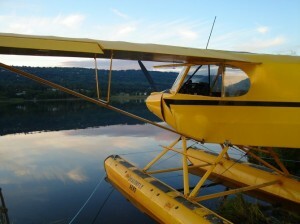 Floatplanes require an ice-free lake to take off from. Usually they would not be able to take off this early in the year, but the weather’s been warm enough to melt the lake almost completely. Pilots have taken advantage of the early start, it seems. My dad and his best friend are both pilots, and like to make use of the good weather. With how lovely it’s been, I’m sure they’ll be out flying in no time! Though watch out—the leeches have thawed out, and they have a tendency to chase people in the water. Beware the attack of the leeches! 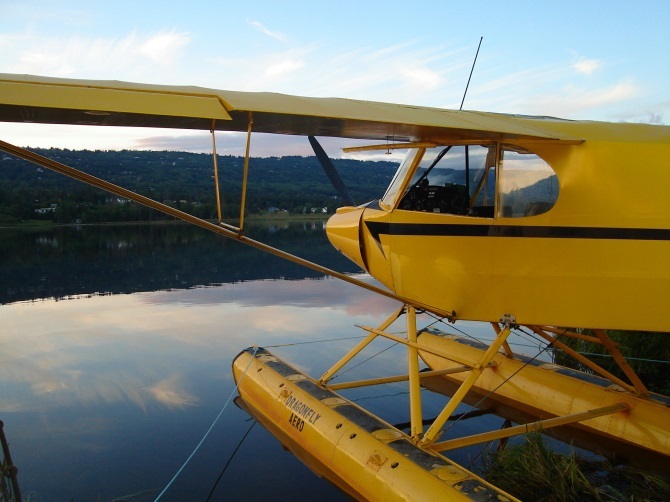 Enjoy our lovely weather by watching floatplanes take off from the lake, or even riding one yourself! Bear viewing expeditions are available soon. 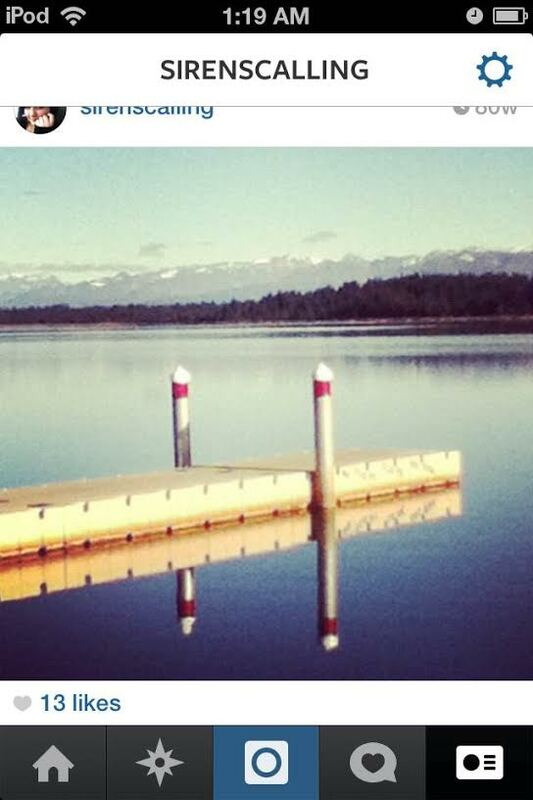 You will take off from Beluga lake, circle the area looking for bears, then land safely back on the waters of Homer. 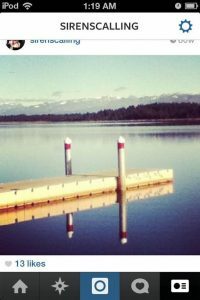 Float planes are a sure sign of spring in Homer. As Beluga Lake thaws out, expect to see more of our mechanical water birds in the sky. Maybe the Beaver will even make an appearance! Either way, it’s time to sit back and enjoy the sounds of spring—splashing water and engines. In the spring a very relaxing activity to do is go for a walk on the beach. The breeze from the water is calming, and you get to smell the salt water and the winds around you. The sand softens under your feet as you walk closer to the water. At the Anchor Point Beach there are beautiful sunsets and a low tide to walk along. Take off your shoes and take a walk on the cool, damp sand. View the birds in the distance while you are taking pictures with your friends or family. 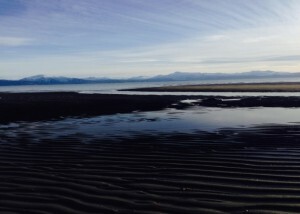 Walk through the shallow puddles that outline the sand down by the shore. 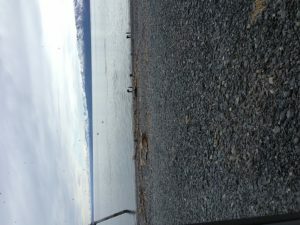 The photo above is a picture I took at the Land’s End beach. I love going down to the end of the spit to watch the boats zoom or sail by. Another enjoyable part of this beach would be watching the people fish near the edge of the water. Occasionally you will see sea otters and whales passing through. Watching the otters eat is one of the cutest photographs you can take. If you go down to the beach at the right time you will see a view of the whole sun. 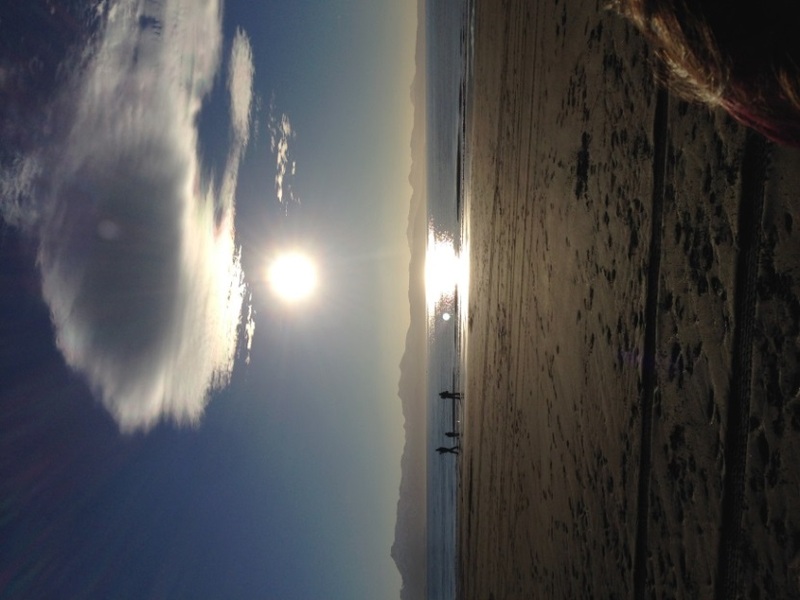 The sun reflecting of the ocean is a beautiful view. The water below the sun glistens and shines towards the sky. Watching the clouds above the beach is delightful. While the tide is low make designs in the sand and take pictures of them so you will always have a memory of your sand art. Even on a snowy spring day the beach is a place to go and walk your dogs. The snow is hardly there and it gives you a place for your dogs to clean off the mud. 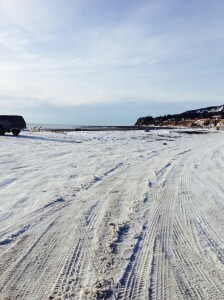 Snow on the beach is nice because you have the option of walking on rocks, sand, and snow. Enjoy the snow while enjoying the ocean it is a win.